"The apothecary gestured towards a shelf holding countless bottles, some labeled "solvent" or "for lung tightness", but most as perfumes; "perfume, relaxing", "perfume, agitating", "perfume/sleep agent" and so forth, all made up exquisitely in coloured flasks with beautiful labels." With its myriads of scented blossoms all year long, the Yellow forest is considered the most beautiful forest of Gdera. The export of scents has made the lands prosperous, with much time for art and education. Smells can present a danger on journeys; some are narcotising, others poisonous, bad for breathing, seeing, or thinking. The entire forest seems like a garden, even plantations look like parks. The animals partake in the olfactory symphony. The Yellow forest grows in the temperate and subtropical regions; some plants grow blossoms instead of leaves, most bloom several times a year. "I have to hurry to finish my dress for the lights festival. I only got the one for the two moons day done in time, and there are still those for the day of four seasons, west holiday, and the Parashinan nights to sew. I wish I'd earn better so I could have some really fancy dresses." 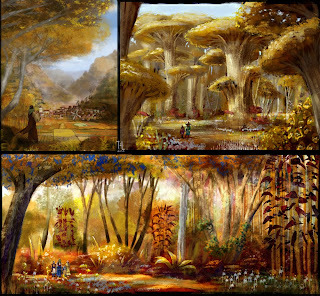 The Yellow forest inhabitants are vivacious and open-minded and care much for aesthetics. 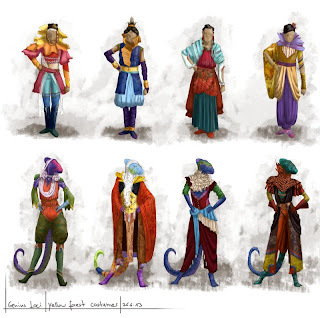 Their clothing is rich, varied, and playful, and include breathing masks against dangerous smells. Poetry is an admired art, and Nuralks poems are widely known and cited. Buildings are open to the wind and its scents, and life happens mostly outdoors. The Yellow forest always looks like autumn, which I love like all painters. I look forward to painting the pronounced aesthetics of the people and landscape. 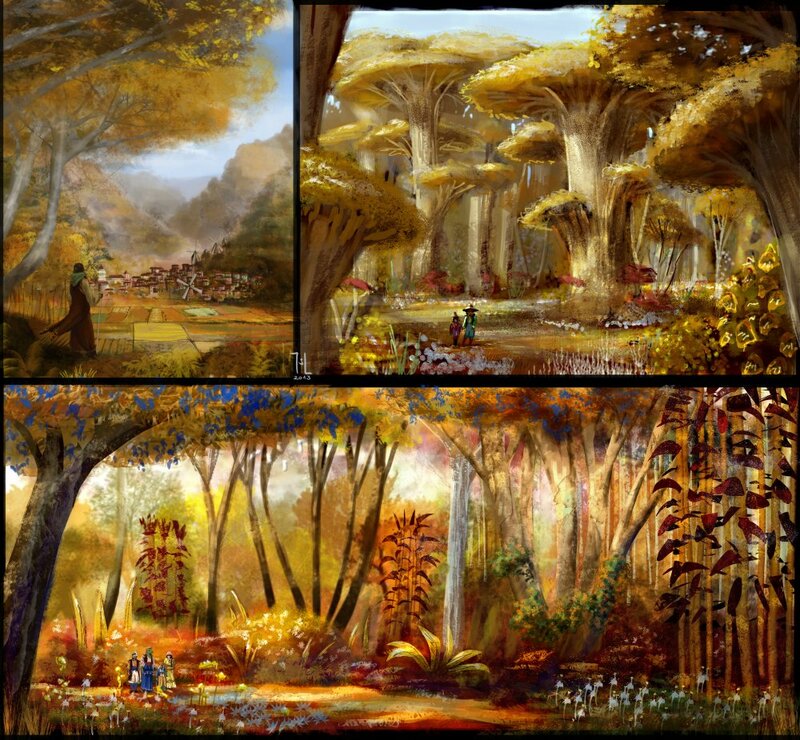 The Yellow forest is perhaps the place in Genius Loci where my style definition of "elven orientalism" comes out the most. Stories taking place here will be more about politics and such than natural disasters, and odd effects on people caused by weather. "My grandmother left an echo when she fell sick that comforted me until I grew up. I later met the echo of Genaleonder Blue Hands at the battlefield of Tix; she taught me the sword." 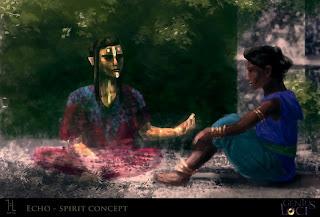 Echoes are the third kind of natural spirits after nature spirits and dead spirits. They come into existence in a moment of utmost importance to someone - the signing of a treaty, finding one's love, the birth of a child, to name a few. It is always very individual. Most echoes fade over time, but some linger for centuries or millenia, often left by great people, and are popular teachers. The person siring an echo doesn't need to be dead, and echoes aren't dangerous per se. "A bug fairy's echo - I laughed the first time I heard. But when I met it, the purity of its happiness about having saved the child was truly heartwarming. As was the grace with which it declined the sweets I offered, as if it knew it wasn't corporeal; a knowledge many echos lack." Not all echoes are aware they're ghosts, and are repetetive, stuck in the moment they came into existence. But they're eager to spread their knowledge; a few of the most powerful even retain the ability to cast spells. Some people have left several echoes, and some parts of the world are filled with them as people leave echoes on any occasion. After making the dead spirits very dangerous, I also wanted nice ghosts. It must be interesting to meet oneself as a ghost; echoes do not develop, and by kitaian cosmological philosophy, you aren't the same person at any moment as you were in any other moment, therefore you and the echo are not the same. Perwons seem to have no other use than being loved. They have a snakelike body covered in fur, a pointy snout and large ears. They slither, using their single pair of legs to hold food, scratch, and climb. Perwons come in rusty red or shades from pearl grey to jet black, always with a white tailtip set off with a black stripe. 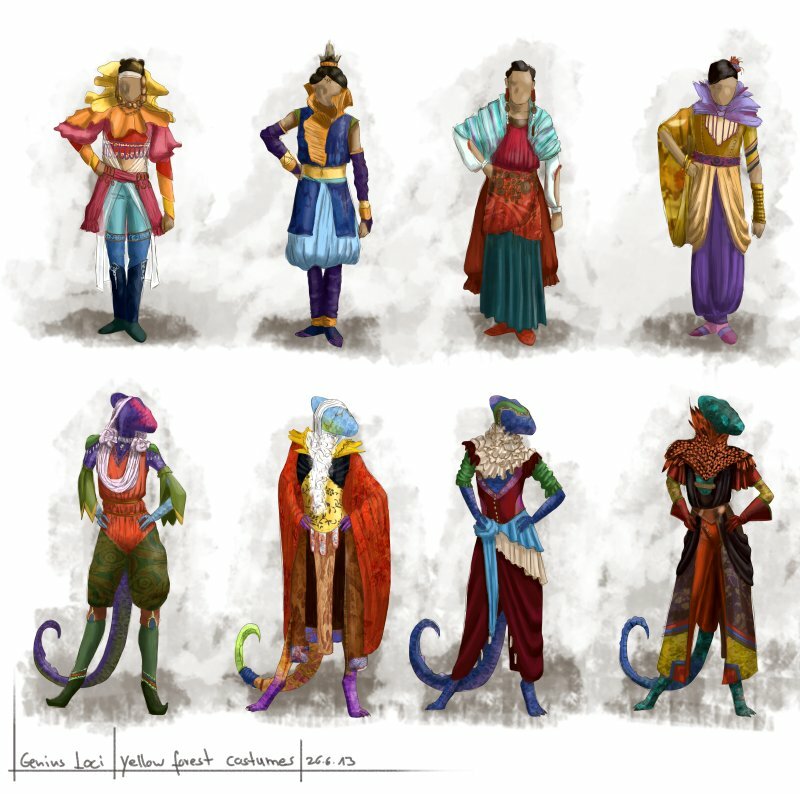 They love heights, greasy food, and skin contact, can jump surprisingly high and are nice to wear as clothing as well. "Keep that hairy beast out of my study or I'll wear it for a hood! No, I won't stop eating my 'fat-dripping' garnais there - teach it not to beg instead, for spirit's sake." Perwons have no use in the household. They are cute pets for children and people with time to react to the nudging and to clean the hair away. Sometimes they are bred for fur, but need good treatment to develop nice pelts which makes them mainly luxury goods. Wild perwons are also hunted or trapped for it. One only needs to feed them to get them into the house, and parents enjoin upon their young to not share their snacks. It was interesting to learn that polynesian cultures wore dog furs, and here we have small animals used as pets, which can also be worn. 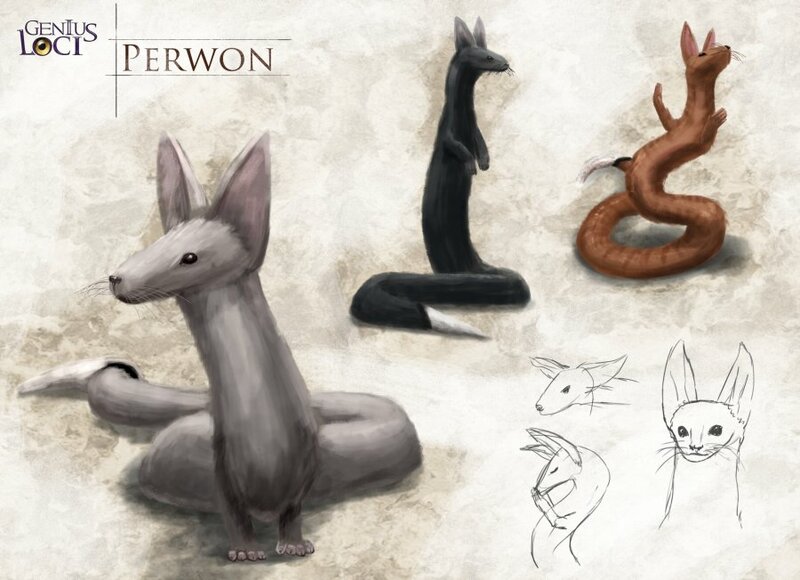 Perwons are much like cats (they don't purr, though), but the main inspiration for the physiology of two-legged slitherers are medieval wyrms.